Copying an existing report and modifying the copy is the easiest and most non-threatening method for creating a new report. The original report remains unfettered, and you can feel free to go wild with the copy. It will probably turn out great, but it's good to know you can experiment without dire consequences. You can always delete the copy and start over again with a fresh copy. The Custom Reports dialog box appears (see Figure 12-34). Figure 12-34. The Custom Reports dialog box shows all built-in reports and report formats. 3 In the Reports box, click the report you want to copy and then click Copy. One of three possible dialog boxes appears, depending on the format of the report you're copying: Task Report, Resource Report, or Crosstab Report (see Figure 12-35). Figure 12-35. 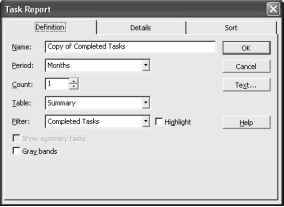 The Task Report dialog box appears for any report based on task information. 4 In the Name box, which shows Copy Of <Report Name>, enter the name of your new custom report. Make sure it's a unique name in the Reports list. 5 Make any changes you want to the report content. Use the Definition tab to set the fields, time periods, and filters to be used. Use the Details tab to specify additional information you want to add to the report. Use the Sort tab to specify which field should dictate the order of information in the report. 6 Make any changes you want to the report fonts by clicking the Text button. The Text Styles dialog box appears (see Figure 12-36). Figure 12-36. 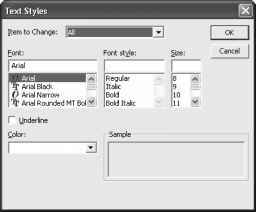 Change the font of various items in the report using the Text Styles dialog box. In the Item To Change box, click the report element whose text you want to format and then specify the changes throughout the rest of the dialog box. When finished, click OK.
7 When finished with your new report's definition and changes, click OK in the report definition dialog box. The name of your new report appears in the Reports list in the Custom Reports dialog box. 8 Select your new report if necessary and then click Preview to generate the report and see what it looks like. 9 If you want to make further changes, click the Close button in the Preview window and then click Edit. The report definition dialog box appears again.